At present, no reports are focused on fluoride-induced hepatic inflammatory responses in human beings and animals. 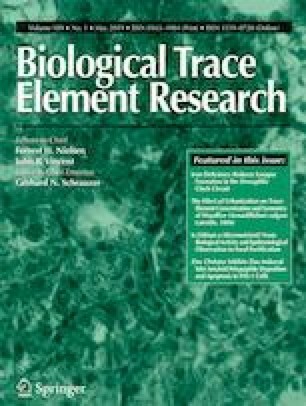 This study aimed to investigate the mRNA and protein levels of inflammatory cytokines and signaling molecules for evaluating the effect of different doses (0, 12, 24, and 48 mg/kg) of sodium fluoride (NaF) on inflammatory reaction in the mouse liver by using methods of experimental pathology, quantitative real-time polymerase chain reaction (qRT-PCR), and western blot analysis. We found that NaF in excess of 12 mg/kg caused the hepatic inflammatory responses, and the results showed that NaF activated the mitogen-activated protein kinases (MAPKs) signaling pathway by markedly increasing (p < 0.01 or p < 0.05) mRNA and protein levels of apoptosis signal-regulating kinase 1 (ASK1), mitogen-activated protein kinase kinases 1/2 (MEK1/2), extracellular signal-regulated protein kinases 1/2 (Erk1/2), mitogen-activated protein kinase kinases 4/7 (MEK4/7), c-Jun N-terminal kinase (JNK), p38 mitogen-activated protein kinase (p38) and mitogen-activated protein kinase kinases 3/6 (MEK3/6), and the nuclear factor-kappa B (NF-κB) signaling pathway by increasing (p < 0.01 or p < 0.05) the production of NF-κB and inhibitor of nuclear factor kappa-B kinase subunit beta (IKK-β) and reducing (p < 0.01 or p < 0.05) the production of the inhibitory kappa B (IκB). Thus, NaF that caused the hepatic inflammatory responses was characterized by increasing (p < 0.01 or p < 0.05) the production of pro-inflammatory mediators such as interleukin-1β (IL-1β), interleukin-6 (IL-6), interleukin-8 (IL-8), monocyte chemotactic protein 1 (MCP-1), and cyclooxygenase-2 (COX-2) via the activation of MAPKs and NF-κB pathways, and by significantly inhibiting (p < 0.01 or p < 0.05) the production of anti-inflammatory mediators including interleukin-4 (IL-4) and transforming growth factor beta (TGF-β). Linlin Chen, Ping Kuang and Huan Liu contributed equally to this work. The study was supported by the program for Changjiang scholars and innovative research team in university (IRT 0848) and the Shuangzhi Project of Sichuan Agricultural University (03572437; 03573050). L. Chen, P. Kuang, and H. Cui designed the experiments. L. Chen, P. Kuang, H. Liu, and Q. Wei carried out the experiments. L. Chen, P. Kuang, H. Liu, Q. Wei, J. Fang, Z. Zuo, J. Deng., Y. Li, X. Wang, and L. Zhao analyzed and interpreted data. L. Chen, P. Kuang, H. Liu, and H. Cui wrote and revised the manuscript.